Well known as the “Silk City” because of rich harvest of Silk, Ramnagaram is located at a distance of 50 km to the southwest of Bangalore. Ruled by kings of various dynasties, this city became famous after it was featured in the famous Hindi movie, Sholay. A heaven for nature enthusiasts, this marvelous city is surrounded by seven splendid hills which help in increasing the beauty of the town. Lush greenery of the region makes it a tourist’s delight. Different rock formations present in the area offer a number of adventurous activities. Adventure enthusiasts and people who want to experience adrenaline rush, visit this place throughout the year. This town remains a popular tourist destination which is thronged by all kind of tourists, be it nature enthusiasts, adventure sport lovers or wildlife zealots. This place is also known by its pre-independence name, Closepet. Weather of the region remains within comfortable range throughout the year, which makes it an ideal place for enjoying different sports such as trekking or rock climbing. The granite hills can be scaled easily; therefore any visitor can try his hand at it. 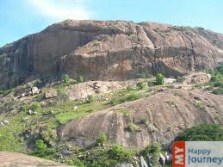 The famous hills which are used for climbing are Rainbow Wall, Anna Thamma and Wanakkal Wall. The famous Janapada Loka which is a place promoting the folk culture and art of the state of Karnataka is also present in Ramnagaram. This institute aims at propagating the rural folk culture of the state. An artificial lake is also present in this place, which makes it a must visit destination.